Did you know Cavachons can come with a smooth coat? This is our first litter with smooth coat puppies. I would imagine less need for grooming with a smooth coat. 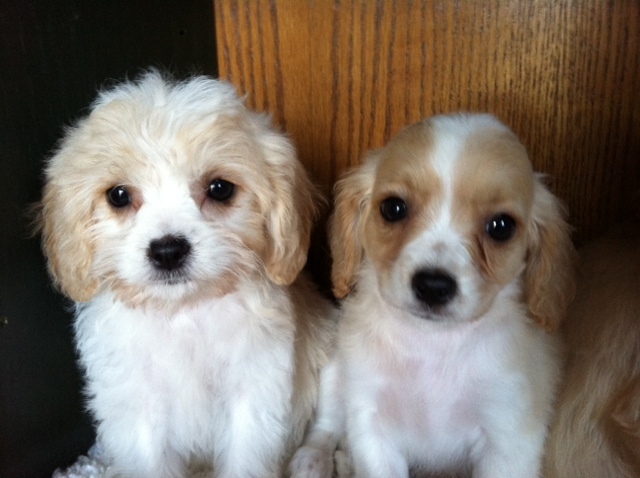 These puppies are sisters from Raven’s litter, both blenheim in color, but with completely different coats. Both super sweet too! I have just given my cavachon puppy a forever loving home. She is smooth haired and has short hair on her face. Her body is a little longer with light waves but is quite fine and downy. I have read that it can take 6 month for their adult coat to come in and was wondering if her coat will stay smooth or will it go more wavy as it thickens up?she is only 9weeks and is called Honey. I think the smooth coated ones stay pretty smooth. We have only have 3 in all the years we’ve bred Cavachons.